Yildiz, G. 2018. Physiological responses of the Mediterranean subtidal alga Peyssonnelia squamaria to elevated CO2. Ocean Science Journal, http://dx.doi.org/10.1007/s12601-018-0044-9. According to Yildiz (2018), much remains to be learned about the impacts of ocean acidification on calcifying macroalgae. And so it was that the Turkish researcher set out to investigate the physiological responses of a lightly calcifying Mediterranean subtidal red alga, Peyssonnelia squamaria, to elevated CO2. More specifically, working in a laboratory setting at Uludag University, Bursa, Turkey, Yildiz grew samples of P. squamaria for three weeks under either normal (8.2) or reduced (7.7) seawater pH, the latter of which values was obtained by bubbling CO2 directly into the experimental tanks to reach the desired pH level. Then, at the end of the 3-week culture period, the author measured algal growth, photosynthesis, calcification and nitrogen metabolism. 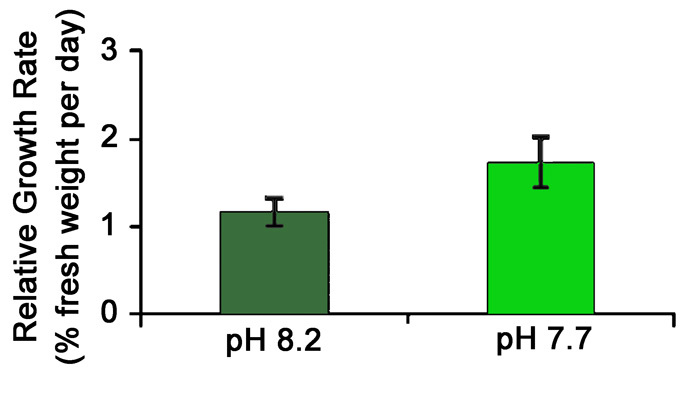 In discussing their findings, Yildiz reports that "stimulated CO2 assimilation of P. squamaria under CO2-enriched conditions resulted in higher growth rates in the low pH treatment than in the ambient pH treatment" (approximately 50% higher, see Figure 1). Other measurements revealed that nitrogen uptake was also stimulated in the ocean acidification treatment, with the author hypothesizing that the algae were regulating their nitrogen metabolism to support their increased growth rates. Yildiz et al. additionally report there was a slight reduction in algal calcification in the low pH treatment. However, the reduction was small enough that, when considering other positive findings that were observed (e.g., increased growth rate and photosynthetic electron transfer rate), the author concludes that "P. squamaria will benefit from predicted elevated CO2 in the future." Consequently, we find yet another example of the fact that ocean acidification is not the serious threat that alarmists often make it out to be. Figure 1. Relative growth rate of Peyssonnelia squamaria growing under two different seawater pH values. Source: Yildiz (2018).